I just came back from BKK last week. I think i am having post-overseas blues right now. I wish i was still there because all you do was to eat.shop.massage.sleep and the best thing about it was that you can absolutely indulge without much guilt because you’ll be walking for the entire day. There’s hardly any escalator at the LRT stations and my hotel was quite a distance from the nearest LRT station. I love their pad thai, Tom Yum Soup and Mango Sticky Rice. They are so delicious and i shall learn how to make them in future. Ok, so i just baked these oatmeal and Raisin cookies. The book stated shortbread but i thought they tasted more like cookies. Specially baked these for my dad because he’s a fan of raisins but i forgot he was having sorethroat. So, he cant hv any. They were pretty nice but they are not one of my favourites. I still prefer my previous Almond Shortbread. Comparing both cookies/shortbread, Oatmeal+Raisins cookies hv a milder milky and buttery taste. Do handle these cookies with care because they break easily especially those with huge pulps of raisins. Add in C and mixuntil well-incorporated. 5. Roll the dough into balls and place them on a pan lined with baking paper. Flatten each ball and mark the top with yr desired pattern. 6. Bake at 150-160 degrees celcius for 25-30 mins or until golden brown. Allow the shortbread to cool completely before removing them from the pan. Store in air tight containers. These are my Scottish Almond Shortbread. 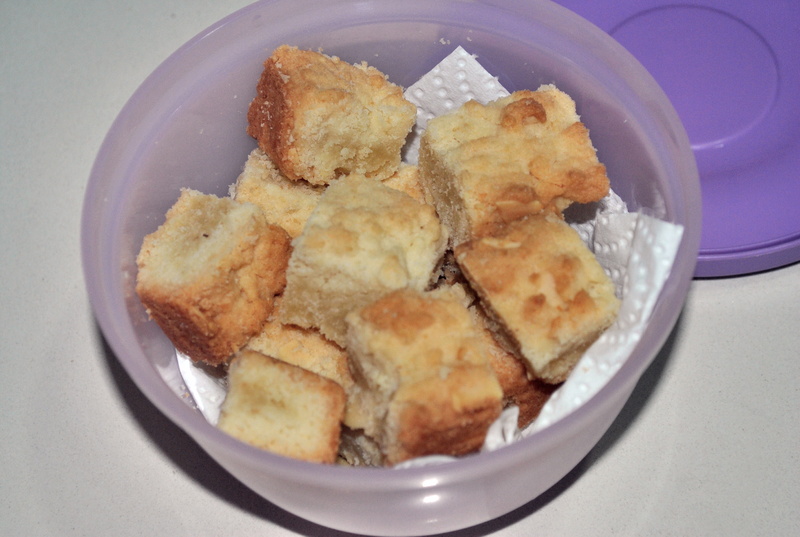 (Apart from the calories,) Shortbread is definitely one of my favourite snack. I love the buttery and a slight pinch of milky taste of this almond shortbread. Next time, I’ll up the almond so it’ll be more crunchy! If you prefer a strong almond flavour,you may want to add more ground almond. I was so excited to see my Almond Scottish Shortbread that I did not refrigerate the dough until firm before sending them into the oven. Refrigerating the dough until firm enables you to cut them into interesting shapes with a cookie cutter. I merely baked them in an 8inch square tin and cut them into little cubes for easy distribution and to fit my containers!! – Toss in C until well incorporated. – Line yr 8 inch square tin w parchment paper and lightly grease it. – Pour yr batter into the tin and use a knife to slice the batter into yr desired shapes that you intend to divide later. – Pop them into the preheated oven and bake them for 25-30 mins/ until slightly golden brown. – Run your knife along the lines you have sliced previously. 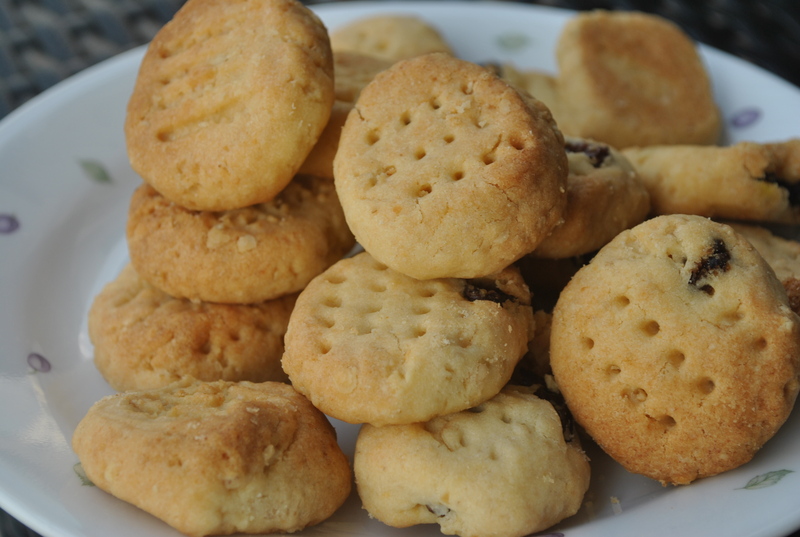 Alternatively, click here for my plain traditional shortbread recipe! 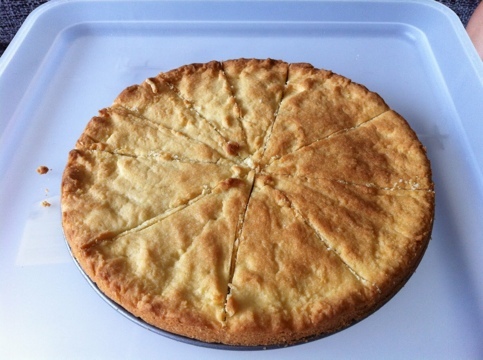 Shortbread is a classic Scottish dessert that consists of three basic ingredients. Really easy to bake. A desert for any occasion. Be it Christmas or any ordinary day. Perfect for a snack in the late afternoon, accompanied by a cup of freshly brewed coffee. Of course, you could also bake them in squares or any other shapes you want. I drizzled some melted chocolate onto my shortbread and it’s delicious. Alternatively, they are ideal for Apple Crumble’s crust too! 3/4 cup of unsalted butter. 1)Preheat the oven to 350 degrees; line an baking tin with parchment paper coming up the sides of the pan, spray with non stick cooking spray and set aside. 2)Using an electric mixer, mix together the confectionary sugar and butter until very creamy. 4) Press the dough into the parchment paper lined pan and press it all to make sure it’s even. Using a butter knife or a bench knife, cut the dough. 5) Bake for 20 to 25 minutes or until lightly golden. As soon as you take them out of the oven, run your knife through all the cuts and let them cool completely. *Remove from the pan and dip them in melted chocolate if you chose or sprinkle some granulated sugar while it is still hot.